Last September NATO troops killed Al-Qaeda leader and former Gitmo detainee in an overnight raid in eastern Afghanistan. Sabar Lal Melma, who was released from Guantanamo in 2007 after five years of detention, had been organizing attacks in eastern Kunar province and funding insurgent operations. A new report released by the House Armed Servicess subcommittee revealed that 27% of Gitmo detainees return to a life of terror after their release. Now Obama wants to release Taliban leaders from Gitmo. 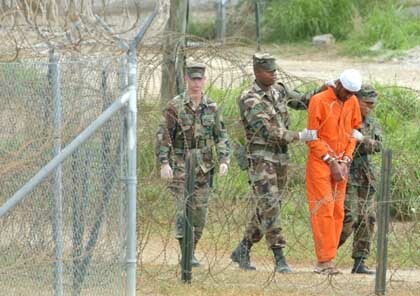 Facing domestic political pressures, the Bush and Obama administrations released or transferred 600 terror suspects deemed an acceptable threat from the U.S. prison at Guantanamo Bay, Cuba, only to face the challenge that 27 percent re-engaged in terrorist or insurgent activities, according to a report by Republicans on a House Armed Services subcommittee. The report, a copy of which was obtained by The Associated Press, provides the GOP perspective on an issue that has divided Washington since the start of the Afghanistan war and the use of the Navy prison for those captured. And it split the White House and Congress last year over how to write rules on handling detainees. The report comes as the Obama administration officials have acknowledged that they are considering whether to release several Afghan Taliban prisoners from Guantanamo and send them to a third country as an incentive to bring the Taliban to peace talks. The step is certain to create an uproar on Capitol Hill, especially among Republicans. The 93-page study is likely to be part of the GOP effort to influence the ongoing debate. In a rare break on a committee that typically is bipartisan on defense issues, Democrats dissented from the report despite efforts to reconcile their differences. The report from the Armed Services investigations panel cites testimony before the committee last year that 27 percent of former detainees “were confirmed or suspected to have been re-engaged in terrorist or insurgent activities,” up from 25 percent the previous year. Intelligence officials had indicated that the number would increase. “The Bush and Obama administrations, reacting to domestic political pressures and a desire to earn goodwill abroad, sought to reduce the Guantanamo population by sending detainees elsewhere,” the report said. “Both administrations faced the persistent challenge of ensuring that the potential threat posed by each detainee had been aptly assessed before transfer or release, and that the countries that received the detainees had the capacity and willingness to handle them in a way that sufficiently recognized the dangers involved. “Despite earnest and well-meaning efforts by officials in both administrations, the re-engagement rate suggests failures in one or both aspects of the process,” the report concluded. The report recommended that the Defense Department, CIA and other intelligence agencies report to Congress on the factors that contribute to a former detainee re-engaging in terrorist activities. The committee also is seeking reports on the effectiveness of agreements with other countries. The report noted that former Defense Secretary Donald H. Rumsfeld held the view that the military should not be a jailer and there was a plan to get detainees out. President Barack Obama also had vowed to close Guantanamo, though he has met strong resistance in Congress.